Food means different things to different people. Today we are rapidly losing control over our local traditional food, food systems and food cultures. Our decisions around food - what we eat, how it is grown, distributed, packaged, marketed and served, are increasingly being controlled by Markets controlled by large corporations. Whilst the Green and White Revolutions were the first step in the industrialisation of our food systems. Agribusiness and food empires are rapidly taking control of our systems of food production, consumption and distribution, thereby impacting our world-views and lives. Communities of once self-reliant and independent small farmers are becoming consumers of market products - fertilizers, pesticides, seeds including genetically modified (GMO) and mechanised technologies. 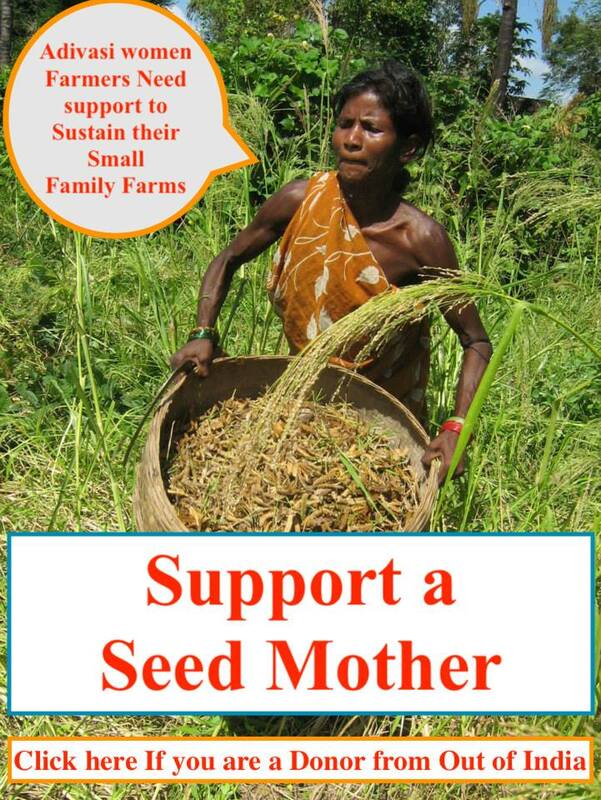 The Seed Mothers are the Environment Entrepreneurs (who voluntarily engage in collecting, sampling, testing, PureLine selection of local seeds and help fellow farmers to adapt these in their crop fields. The traditional local seeds carry the strength of sustaining the crops in extreme climate conditions (i.e flash floods and long dry-spells). 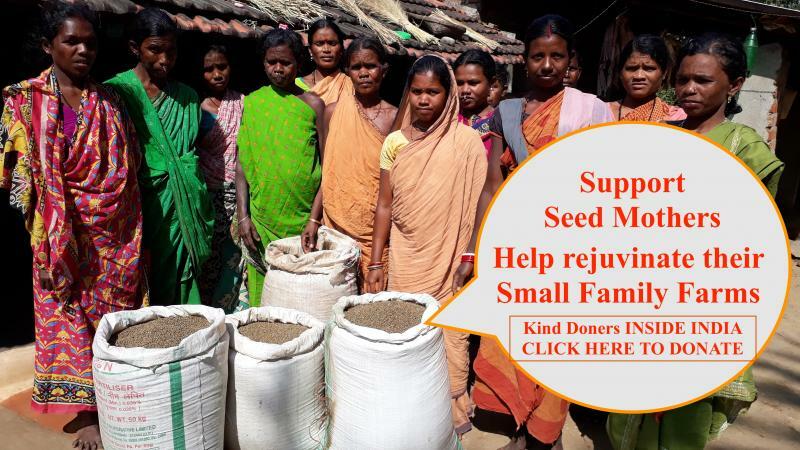 The local seeds have grown with the agro-climatic conditions of the area and support the fellow crops and the soil.﻿A small but timely support can help them get out of the cycles of debt. It would not only help them get out of debt but make them self reliant on their diverse agro-ecologically farmed food crop lands. This way we can deepen Our cultural and spiritual connections to nature and protect our volatile planet from disasters. Let us stop loosing our seeds, breeds, land, water, air, knowledge, health and We should remain sovereign to make decisions about our way of life. We together can stop the pre-existing structural inequalities in society and sustain the natural systems and processes of the planet. Organization for Rural Reconstruction & Integrated Social Service Activities - ORRISSA came into being in the year 1987 as an initiative of a group of young social workers who believed strongly that village sovereignty is the answer to the challenges of governance as well as well being of the communities. The communities decide for themselves as to what they produce, what they consume, what values guides them, how they govern themselves etc. As the organization is based in the areas having dominant populations of Kondh and Koya tribes, the preserved and practiced values of these tribes are the guiding principles for ORRISSA’s interventions. ORRISSA founded as a not for profit registered society in 1989. ORRISSA works at different levels to ensure that the tribes have access to and control over the local resources and produce and consume whatever they decide. ORRISSA works towards low external input based sustainable agricultural practices that are rooted in the traditional agriculture. It works towards ensuring food security to combat hunger and furthering women’s rights. Community based intervention is the prime strategy of the ORRISSA team. Participation of all its stakeholders is the principle that endures within the team structure. This understanding enables the group to operate in a decentralized structure. Issue based field teams operate independently to the local needs. Participatory need assessment, planning, monitoring and evaluation tools are in place to maintain a transparent system and keep up the group spirit of perseverance. In its mission of finding out alternatives for the disadvantaged and neglected, the team operates in some of the most interior pockets of the state of Odisha in Malkanagiri, Kondhamal and Khurdha districts. Over last 25 years, ORRISSA team has been successful in issue-based interventions on tribal rights over Food, Health, Land, Water, Forest and Education through People’s Organizations. ORRISSA has gained expertise on PRA & PLA, Action research, strengthening of traditional Adivasi People’s Organization including promotion of women cooperatives, food security, Local resource based Sustainable Agriculture, Disaster Mitigation, Literacy, Forest and Natural Resource Management, Land & Water Management and Advocacy & networking. Presently ORRISSA concentrating on strengthening people led initiative for food sovereignty, local resource based sustainable agriculture, creating sustainable income sources for the tribal households through plantation of fruit bearing trees and other income generation activities, women empowerment, Research, advocacy and networking.